We discuss exponential improvements in electronic, storage and communication technology and backbone networks. The first NSFNet backbone links had a speed of 64 kilobits per second. Today, links with speeds of 10 gigabits per second are common. That is considerable improvement, but researchers have recently achieved 164 terabits per second over a distance of 2,500 kilometers, an indication that we will one day see much faster backbone links. The researchers reported using "164 wavelength-division multiplexed channels modulated at 100 Gbps in the effort." In plain English, what is that saying? How many times faster is 164 terabits per second than 10 gigabits per second? How many times faster is 10 gigabits per second than 64 kilobits per second? We have discussed mobile device form factors. We still don't know what form factor the public will choose, but we just got an indication. Apple's iPhone is a better Internet access device than any previous cell phone, and, since it was introduced, Google has seen 50 times more searches on the iPhone than any other mobile handset. Virtually all phone manufacturers are working on touchscreen devices similar to the iPhone, and many of them will use Google's Android operating system and application bundle. Phone manufacturer Nokia is convinced the public will want mobile Internet access. They recently purchased NAVTEQ, the street mapping company used by Google Maps and others. Olli-Pekka Kallasvuo, Nokia president and CEO, believes GPS chips will be as common in mobile phones as cameras. He says "navigation is one of the foundations of the context-aware mobile phone. We believe it will be as important as voice capability was 20 years ago." IPhone users like to access the Internet, but that does not prove the billions of simple cell phone users will feel the need to convert. Is mobile Internet access important to you or are you satisfied with your current cell phone? If you had a mobile Internet device, what would stop you from running Skype or another VOIP program instead of using cell call minutes? Check these hypothetical auto navigation videos from NAVTEQ -- would you use these applications? As we have seen, there are data centers and Internet exchange points in many cities. These are very large, but they pale in comparison to the data centers being built around the world by Google, Microsoft, Amazon, and other large organizations which hope to provide the utility infrastructure for the era of network-based applications. Consider Google's data center in The Dalles Oregon, which is described in an article on "Information Factories" by George Gilder. The data center at The Dalles is the latest and most advanced of about two dozen Google data centers and is estimated to house at least 450,000 servers. Google located the data center at The Dalles because electric power was plentiful and cheap. A study published in 2007 estimated that in 2005 servers, cooling and auxiliary infrastructure consumed 1.2% of US power, an amount comparable to that for color televisions. The 2005 electric bill was about $2.7 B in the US and $7.2 B for the world. Network World estimated the 2006 US bill at $4.5 B -- about 1.5% of US electricity for the year -- and expects that to double by 2011. Given these costs, Intel, AMD, SUN and others are working very hard to produce low power electronics and servers, but the number of servers is rising rapidly. Harper's Magazine took a somewhat critical look at the politics involved in bringing Google to The Dalles. The Economist has also had an article on the global growth and consolidation of data centers. For ongoing discussion of power and the environmental impact of this topic, see Bill St.Arnaud's blog Green IT/Broadband and Cyber-Infrastructure. This article in the New York Times Magazine talks about data center power and other characteristics -- from the point of view of society and organizations. Our communication infrastructure, data centers, and personal computers consume a lot of electric power. Do they save power as well? We discuss blog applications and platforms. But, out of the millions of blogs, how do you find one you want? This post gives tips on searching for blogs on a given topic. Once you find a good blog, you can subscribe to its RSS feed. But, instead of getting notification of every post, you might want to filter the feed, only receiving notification of the better ones. Aiderss.com offers one approach to feed filtering. They compute a postrank score, and only include high-scoring posts in the feed. Try Aiderss pagerank pagerank filtering on a blog that you read, and see whether you agree with its selection of the best posts. Aidrss is an attempt to cut down on information overload -- do you feel overwhelmed by a flood of information? We discuss location-based applications, and the US Federal Communication Commission has mandated that all cell phones be location-aware for emergency 911 service. Carriers are working toward that goal, and eventually, all cell phones will be equipped with a GPS (global positioning system) receiver or use other technology to record their locations, enabling real time monitoring. Real time GPS could be used to monitor fleets of delivery vehicles or taxis, children, pets, criminals under house arrest, etc. Does this capability raise concern over privacy? We discuss backbone connectivity, including udersea cables. The first undersea cable carried telegraph traffic between New York and London in 1858. The map also shows the site of a recent cable cut off the Egyptian coast. The cut was attributed to a ship dragging its anchor, and repairs are underway, but some wonder if it may have been cut intentionally. 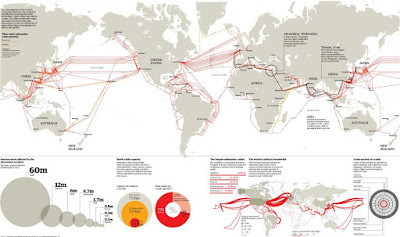 Undersea cables are high-capacity components of a rapidly growing global nervous system. (You might think of the connected people and computers as being like neurons). You can read the story of the construction of the FLAG cable in an epic article from Wired Magazine entitled Mother Earth Mother Board. You can get an idea of the history and importance of undersea cables in Arthur C. Clarke's "How the World was One" or check this Web site on the history of Atlantic and other cables. Satellite links also carry intercontinental traffic -- how does their speed, capacity, latency, and ease of deployment compare with undersea cables? We discuss mashups, and public data is becoming available for mashing up on the Internet. Consider Maplight.org. Using Maplight, one can correlate voting on a bill with contributions. For example, the Medicare Prescription Drug Price Negotiation Act of 2007 requires the Secretary of Health and Human Services to negotiate lower drug prices on behalf of Medicare beneficiaries. As we see below, interests wanting this bill to pass contributed more to legislators voting yes than to those voting no. Maplight currently has data for the Federal and California legislatures, with other states under construction. For more on their capability, see this video tour. Prominent blogger Jon Udell has a strong interest in the availability of public data on the Internet. You can see what he is finding and learning by tracking his public data bookmarks. Who are your representative and senators? Which special interests are supporting them? How are they voting on issues of concern to you? What data does your local government publish on the Internet? Do they make it easy for users to access it and create mashups? A slidecast is a slide presentation with synchronized audio, and Slideshare.net is an Internet service for creating and sharing slidecasts. As shown here, the user can watch continuously or skip from slide to slide using the viewer controls. One creates a slidecast by uploading a PowerPoint, PDF or OpenOffice presentation with the slides and an mp3 file with the audio track. The site provides editing tools for selecting and adjusting the portion of the audio file to play with each slide. You can see how it is done in this how-to screencast. The slideshare site also has the features of a typical social networking site, allowing viewers to comment on, evaluate and search for slideshows. You can also upload and share a slide presentation with no audio track. Do some of your professors use slide presentations in class? Would it be helpful to have them available for viewing after class as slidecasts? Have you made a presentation that you could have recorded as a slidecast? I added a new course note explaining the idea of exponential growth -- growth at a constant rate. We discuss the progress in electronic, communication and storage technology that underlies advances in network-based applications. Robot designer Rodney Brooks uses the Apple iPod to illustrate improving storage capacity. If the current exponential rate of growth continues, an iPod will be capable of holding every movie ever made by 2020. (That includes all the bad movies -- he figures all the worthwhile movies will fit by 2016). Brooks made the point in a talk outlining his work on robotics. You can hear an excerpt on the growth of iPod storage here, listen to the entire talk here, or watch videos of a robot in Brooks' lab interacting with humans here. How old will you be when your iPod has the capacity to hold every movie ever made? What other applications might it be used for? Will it be useful to you in your work and career?